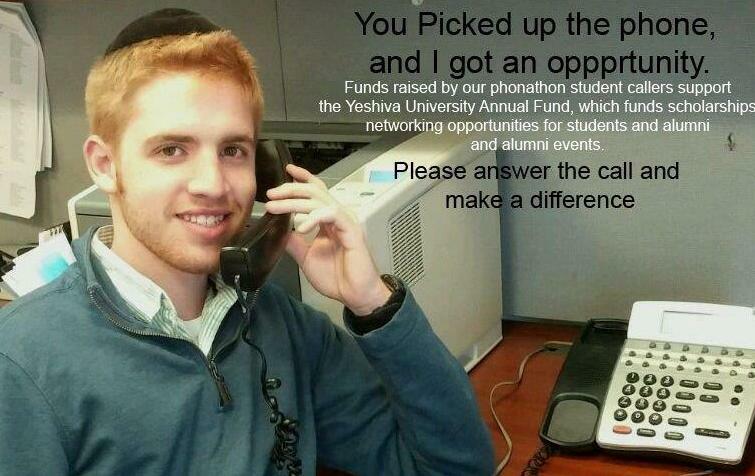 October 30th was a memorable night at the Yeshiva University Annual Undergraduate Phonathon, hosted by the Office of Alumni Affairs and Annual Giving. Young alumni volunteers returned to the Wilf Campus after their workdays to phone their peers and ask them to support their alma mater, as well as enjoy good food and fellowship. Volunteers included Suzanne Mazel ’11S and Jack Voystock ’12YC, Lea Epstein ’11S and Ben Sanders ’12YC, Yael Refah Mandel ’12S, Ephie Mandel ’12SB and Eli Shavalian ’14YC, several of whom also volunteered their time to phonathon as undergrad students. The group, who reached out to graduates of the last decade, informed them about the importance of giving back and encouraged their participation through annual gifts. Young alumni donors who made a gift that evening were inducted into the Gold Society. The Gold Society—Graduates of the Last Decade—was created for our young alumni. These alumni play a vital role in seeing that current and future students have the same opportunities they had as students, and their support helps increase Yeshiva’s ranking and the value of its degree. Thanks to Suzanne, Jack, Lea, Ben, Yael, Ephie and Eli for their help fostering a culture of philanthropy and giving among the young alumni of Yeshiva University. They helped secure donations from their peers, and they prove that all graduates can make a difference!